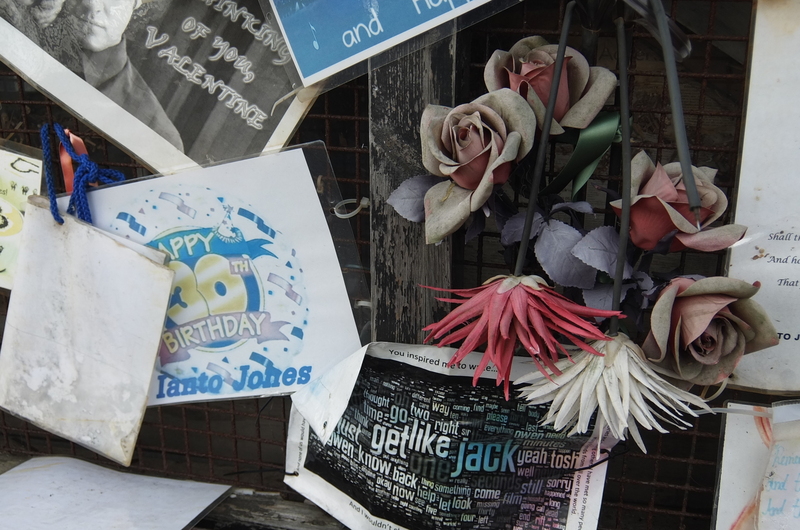 Katie Hamer continues her quest to write the Cardiff A-Z … today, she’s visiting Ianto Jones’ shrine in Cardiff Bay. 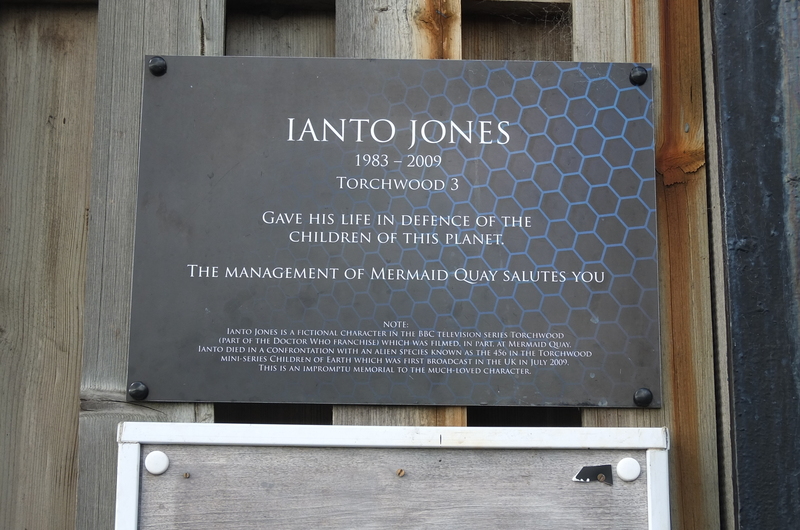 Field Agent for the Torchwood three, Ianto Jones regrettably passed away in his hometown of Cardiff aged 25, while in the line of duty. His partner, Captain Jack Harkness, survives him. Remembered for his heroic actions he will be sadly missed. 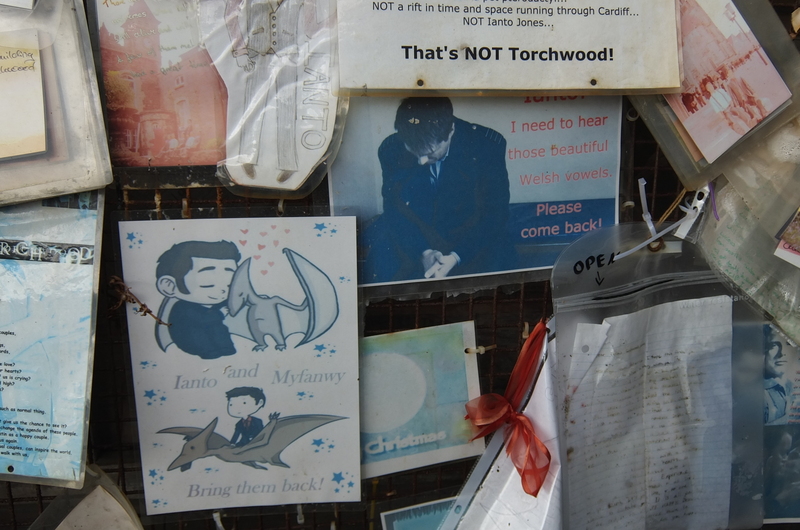 Mild-mannered and reserved, Ianto was initially employed as a ‘tea boy’ by the Torchwood Three. However, his actions gained him the trust of Captain Jack, and their relationship blossomed. He was also known for his sense of humour. His mourners recall many a good humoured moment, such as when he bought a wedding dress for a friend. The shop assistant walked up to him as he was holding the dress to a mirror. Upon hearing Ianto’s explanation for his actions, He very tactfully informed him that he had men buying wedding dresses for their ‘friends’ all the time. LOL! 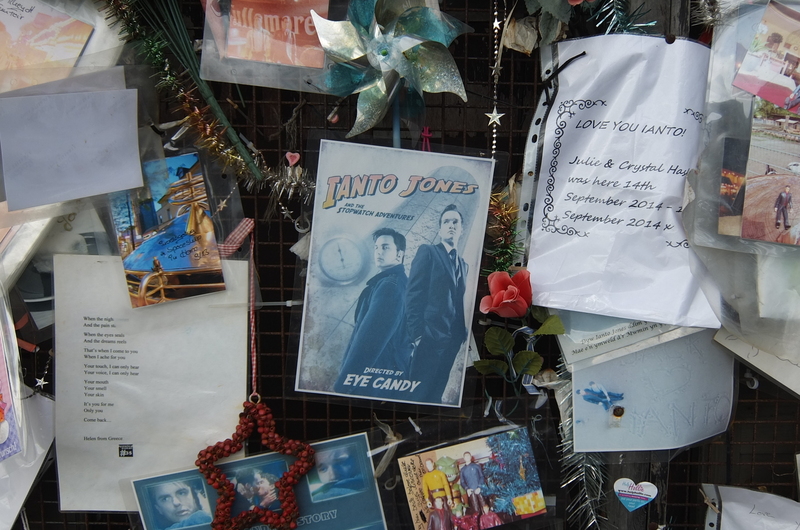 Rarely has there been such a national outpouring of grief, as for Ianto. His mourners visit the shrine on an hourly basis, leaving flowers and messages of grief. Some mourners clearly have reacted angrily to his passing, with suggestions that his death could have been avoided. Who knows? I, myself, sensed some otherworldly intervention, when I arrived home after my initial visit to find my photos had been wiped from the memory card. Had they been erased from beyond the grave? Upon my second visit, I decided to stay longer paying my respects. I was amazed at the diversity of the mementoes. There are Christmas decorations, coffee cups and, heaven forbid, even underwear. Well, the mind boggles! As with Elvis Presley, some of his most devoted fans have even gone as far as to suggest that he is still alive. He’s not dead; he’s just gone globetrotting, apparently. They’ve even posted photos from around the world to ‘prove it’. 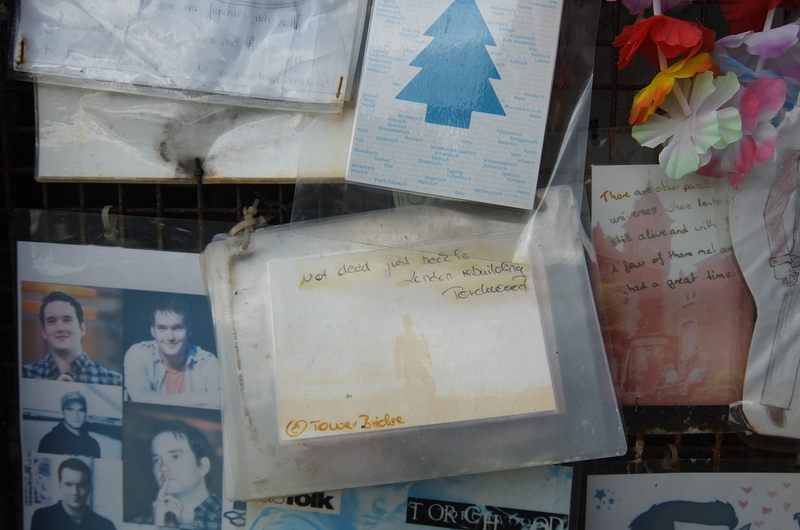 There are also Christmas cards, and 30th birthday balloons, a milestone he sadly never reached. 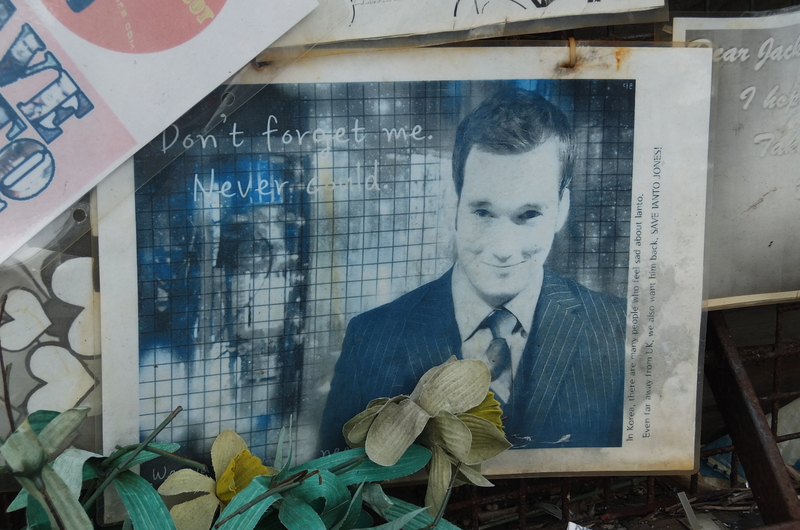 I noticed for the first time, upon my return, a photo upon which was scribbled Ianto’s final words: “Don’t forget me”, and Captain Jack’s response: “[I] never could”. My photos didn’t erase after this visit, so maybe these words were a message to me from beyond the grave. It certainly brings a tear to my eye. Sob! I hope you take a quiet moment to study my photo gallery. 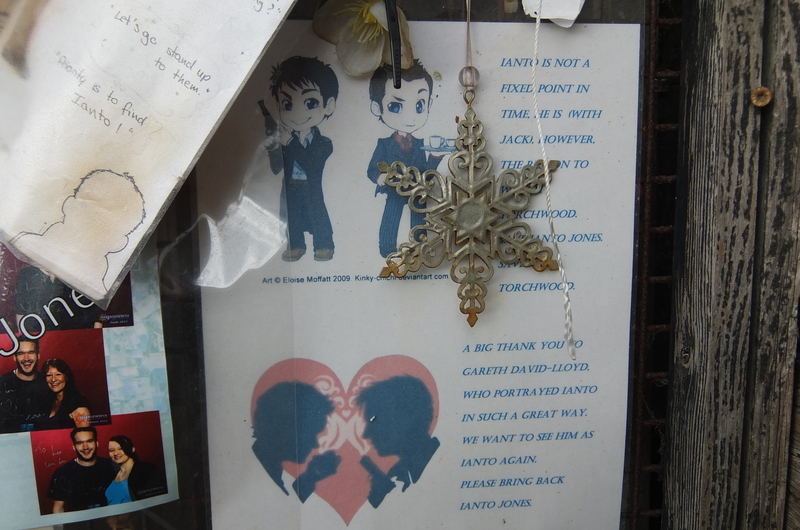 If you felt moved, upon visiting Ianto’s shrine, I’d love to hear from you. Thank you for reading! A hero in the league of Indiana Jones? 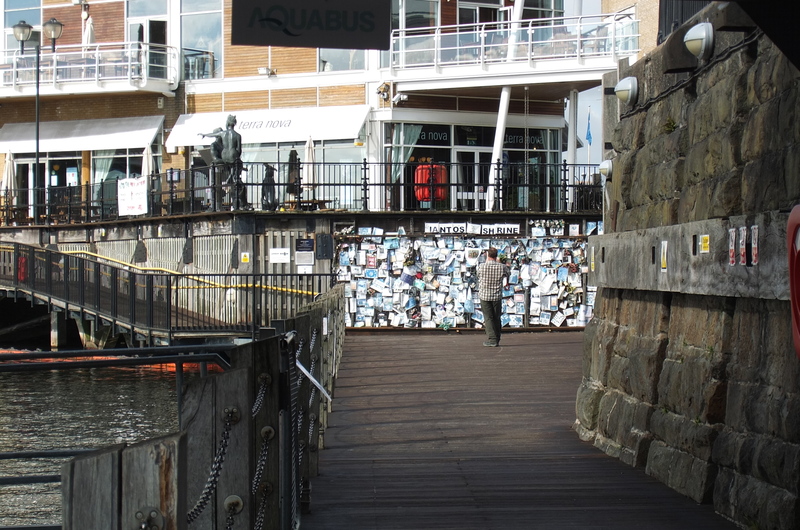 Ianto and Captain Jack – what a partnership! He’s not dead; apparently he was spotted at Tower Bridge in London! 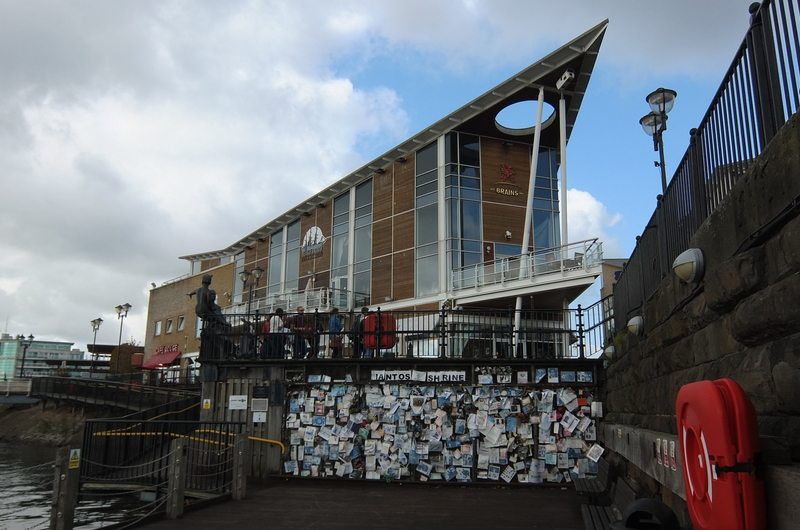 You can find the shrine on the waterfront in Mermaid Quay, Cardiff Bay. ← Cardiff’s answer to Riverdance! Amazing! I love this! 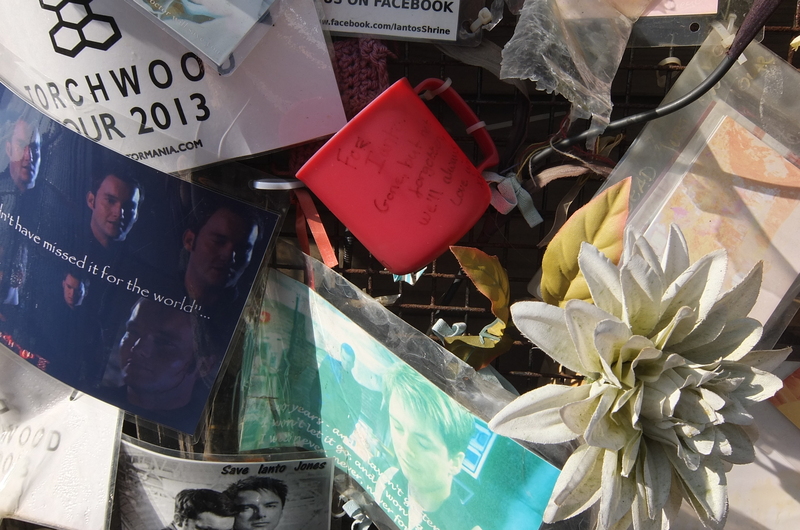 But for me, Ianto will be always alive! 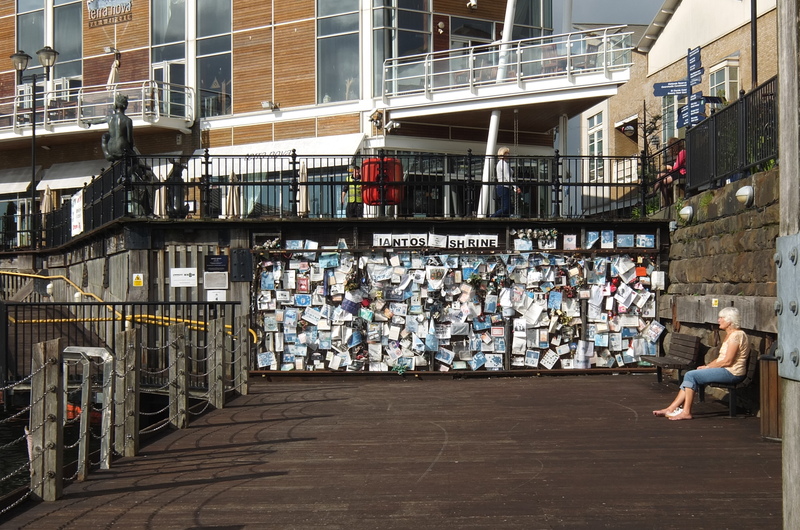 Although I wish I could go to Cardiff only to see Ianto´s Shrine. And Jack and Ianto are happily together . What amazes me is how long this has held up. I mean the show has been “canceled” for a few years now. It must be weird for the actor to some degree. Too bad they don’t bring this show back.